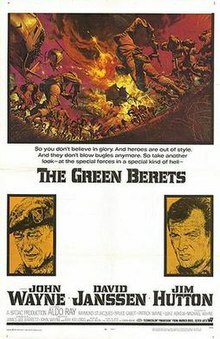 It was fifty years ago today- the movie “The Green Berets” was released in the movie theaters in the United States. This was a John “Duke” Wayne project- he starred in the movie along with Jim Hutton, David Janssen, Aldo Ray, Patrick Wayne and Jack Soo. The movie was based on a 1965 novel by Robin Moore. Duke Wayne was determined to make this movie to show the pro-military position on the war in Vietnam. Pretty bad timing for the movie- by it’s release in mid- 1968- the TET Offensive had happened in Vietnam, Uncle Walter had deemed the war a failure and the anti- war movement was growing. In making the film The Duke got full cooperation from the US government from President Lyndon B. Johnson to the Department of Defense. The film took a very anti-communist slant and was very pro-Saigon. It would be a commercial success- after all The Duke was in it- making $21,000,000 at the box office which was a lot back then. The critics hated it. Roger Ebert gave it no stars and would later put it on his most-hated films list. Other critics hated it just as badly. I tried to watch it a few years ago when it was on TCM and after about 45 minutes gave up on it. For Duke Wayne fanatics.